Magento is a powerful eCommerce platform created using open-source technology that gives both developers and owners a huge amount of flexibility in how the website looks and functions making it a popular choice for many businesses both large and small. Magento also has the advantage of coming in 3 different versions which allows clients to pick the version that suits their business without wasting money on features they don’t need. In our experience Magento is particularly popular for its easy to use interface, excellent reporting and for a great range of extensions that allow clients to take advantage of everything from blogs to subscription models and memberships. Planning Your Next ECommerce Project In Magento?Get in touch with us! How can New Media Guru help with your Magento site? Create multiple eCommerce stores to take advantage of customers users multiple languages and currencies. Access the wealth of knowledge and experience of a team that includes experts in design, Magento and HTML5 in addition to dedicated account and project managers. Use multiple payment methods without hassle while saving time using Magento to manage all of your orders and shipments. Use extensive options to customize the way visitors see your store including add-to-cart options, social media options, the capability to compare different products and review and rating systems. Switch the focus of your store to your customers, allowing them to create profiles and wishlists and allow them to review their shipments, orders and reviews. Take advantage of powerful marketing options including social media options, referral systems and affiliate marketing. Don’t forget your mobile customers! Our Magento solutions are fully-accessible to mobile-users with mobile-optimized versions. New Media Guru provide extensive training on how to use your Magento eCommerce store as well as detailed user manuals. Our development team is with you for the long-term – we provide as much support, maintenance and expertise as you need. Magento is a fantastic platform for vendors seeking a multi-vendor solution and something our team have a lot of experience providing. Membership solutions using recurring subscriptions are a great source of ongoing income and can be easily integrated into your Magento solution. We’ve built many online shops for businesses in the fashion industry, providing them with everything they need to take their online fashion store to the next level. With mobile templates, multiple transaction options and a fully-customizable product display Magento is perfect for the lifestyle industry. We have extensive experience developing online eCommerce stores for companies in the Jewellery industry. One of every four online ecommerce businesses choose Magento, including the biggest online brands, some are Samsung, Nike, Paul Smith, Ford, Fox and many more. 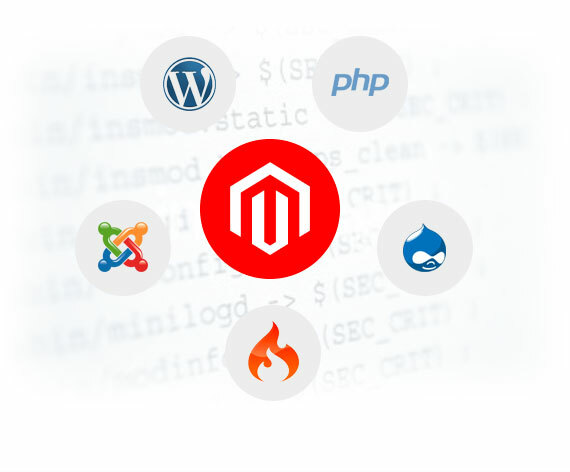 Our team of dedicated Magento developers is ready to face the challenge of providing your company with an easy-to-use eCommerce site enhanced with the most sophisticated tools available. We want your site to be the high performance business you envision.